Recently I was given a chance to walk the path of Jordan’s Branch with a group of students from St. Christopher’s School and it was two hours well-spent. What’s Jordan’s Branch? Maybe you call it Tiber Creek? Either way, the creek is hidden in a pipe under West End streets before emerging for a run toward Bryan Park. I wrote a Why Richmond, Why?!? column about it in February 2013 that turned out to be one of the most popular stories I have written for Richmond.com — and I almost didn’t write it because I didn’t think anyone would care to read about a lost creek. This is the story of a poor little abused creek. Turns out, at least half of poor little Jordan’s Branch is underground, from its origin down to a spot under Willow Lawn Drive. From the 1936 United States Geological Survey, the origin is approximately the intersection of Hanover Avenue and Wesley Road, which is just west of St. Christopher’s School. The creek travels approximately 9,500 feet, contained within an underground piping system and around 2,500 feet of pipe is in Henrico County, the remainder in the City, according to Eddie Childers Jr. with the City of Richmond department of public utilities. If you look on a map or travel through this area, almost none of the real estate above the pipe is developed with retail or residential space, only parkland, green space and roadways, beginning at a triangle park at Maple and Guthrie avenues and Fergusson Road. The students listened to me talk about the process of researching what happened to the creek and all of the stories and feedback I got from the many calls, emails and comments on Jordan’s Branch. 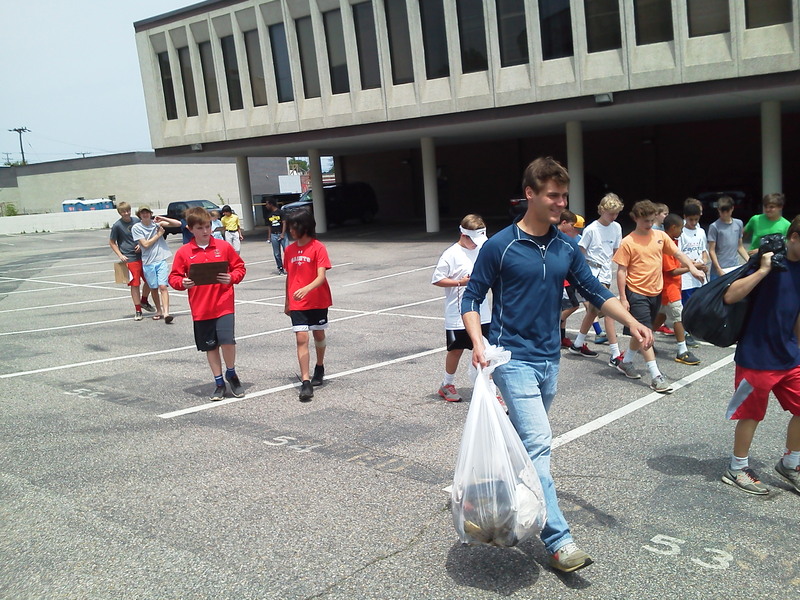 We then marched more than a mile from Broad Street back to campus, picking up trash, counting drainage grates and looking for more ways to study water runoff, erosion, land development and more. Truth be told, I’m still getting feedback on Jordan’s Branch. People are still contacting me about cleanup opportunities, developments along the creek corridor and even people pondering the potential ill effects of infill dirt in that area of the former wetland where the creek once passed through. I’m very grateful to St. Christopher’s for giving me the chance to help with this field trip. Opportunities to teach children like that one are too rare (other than with my own two children), but I get a lot from that type of interaction. Sometimes I think I missed my calling as a teacher or leader of children, but I’ve had the fear that if it were my full-time job, I’d tire of it and lose my passion. Makes me appreciate those who do teach that much more. Why do we allow new construction to have issues? This is how new buildings become old mold infested building that are a risk to children. Be proactive and hold contractors responsible for shoddy workmanship. Leaks in top floor may be roof or pipe leaking issues and lower floor stain indicate plumbing leaks. Toilets not functioning after less than 2.5 years is a construction issue where is the contract administration and lawsuit against contractors. Why does rain leak on walkway over cover once in path and not shield water at doorway. Why Richmond Why?